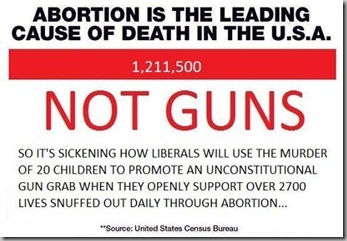 Guns versus abortions - is either one worse? Even as I wrote my column this week, I am still in utter shock at the gut-wrenching tragedy of 15 students and 2 teachers at a public school in Parkland, Florida, being mercilessly gunned down by a psychopath with a high-powered rifle. I am honestly perplexed at this level of evil - senseless, violent hate without a mask. This world-wide struggle to protect children from abuse, trafficking, violence, emotional abuse, health risks, bad moral influences, and, perhaps the biggest struggle, the protection of children in the womb, will continue through the ages until Christ makes all things new. Grievously, there are certain factions of America who immediately stood on the bodies of the children before they even had graves, screaming vitriolic insults at Constitutionalists and Christian patriots that this tragedy is their fault. They have correlated two entirely unrelated topics: the preservation of self-defense and the murder of children. Phrases like, “How can you as a Christian stand for this kind of lawless behavior where people have easy access to guns and kill others? It doesn't make sense - you ought to be for more gun control if you're a Christian!" These hypocritical assertions come from many who believe the act of murder is okay so long as the child is unborn or infant. This is driving me crazy because I can’t even wrap my head around this nefarious, illogical absurdity. As seen in every single mass shooting, the government is completely incapable of protecting the citizenry from these kinds of attacks. If the people do not protect themselves, there is no protection. All “gun-control” laws do is fight or obstruct the people from protecting themselves. Our Founding Fathers dedicated our Constitution to “preserve the blessings of liberty to ourselves and our posterity.” (emphasis added) The Second Amendment was a part of their way to ensure we can accomplish this. I believe today we need “control” of our leaders and make sure that they advocate, endorse, and sponsor the protection of the children and our own God-given right to life, liberty, and property.